New Accord offers plenty of reasons to like Hondas again! 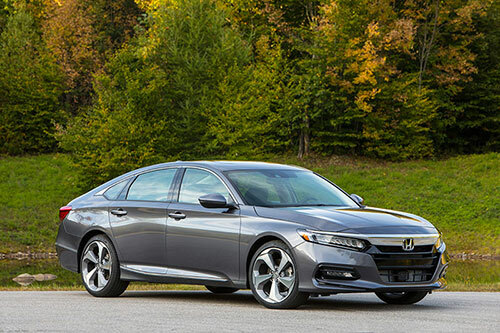 The Honda Accord, all-new for 2018, provides substantial evidence that the Japanese carmaker does indeed listen to its customers (and maybe critics, too!). That's because, after a few years of making vehicles that are nearly as annoying as they are pleasant, the new Accord is a lovely breath of fresh air. I used to love Hondas and always looked forward to driving them. Then the company seemed to go off the rails, doing things that defied logic (as defined by me, anyway) such as removing the volume and tuning knobs from the audio system, forcing you to use a touch screen that wasn't particularly usable – especially while the vehicle was in motion, even if you could figure out the interface. Then there were the nannies, such as the voice that admonished you to do up your seat belt even if you're undoing it upon arrival at home, at a speed of about two kilometres per hour (not that I ever actually measured the speed), or flashed BRAKE!!! at you because it thinks you're about to rear end someone even if you have things well under control. Then there's the styling. Take a look at that new Civic. I rest my case. To be fair, most of the big Japanese carmakers appear to be following this trend toward severe overstyling, so maybe it's something in the water there (though so far Mazda seems to have avoided this issue). Then there are the continuously variable transmissions the company has been inflicting on its line instead of its traditionally very good automatics (Honda still makes some damn fine manuals, fortunately, but you can't get them on every Honda you might like to). And now we have the new, 10th generation of the Accord, a car that has been on Car & Driver magazine's 10 Best Cars list so many times today's school kids probably can't count that high. It's there again now, too, and though I might not go quite that far in my praise of the vehicle, I can see why it would continue to be on that list of excellence. Honda says the 10th generation of the Accord is new from the ground up and features "a lighter and more rigid body structure, an advanced new chassis design, two all-new, high-torque direct-injected and turbocharged engines, the world's first 10-speed automatic transmission for a front-drive car and a new generation of Honda's two-motor hybrid technology, along with a host of new safety, driver-assistive and connected-car technologies – all wrapped in a more sophisticated, sleek and athletic design with top class interior space and comfort." That's quite a mouthful, but fortunately it isn't just empty words. I just spent a week in the 2018 Accord Touring with the two litre turbo four and, though I still don't care for its exterior styling, I'm delighted to tell you that, overall, it's a terrific sedan. The 2018 Accord starts at $26,490 (in Canuck bucks) and tops out on the review sample's Touring trim (2.0T) at $38,790. Two "all-gas" engines are available, both of which are turbos – no V6 is available any more. But both the 1.5-litre and 2.0-liter fours move the car along nicely, Honda saying they produce peak torque "across a broad range of engine speed (RPM), delivering smooth and virtually lag-free power for exceptional throttle response and power delivery in all driving conditions." They're right about the lack of lag, and that's a nice thing (the lack, not them being correct!). And the two litre turbo four puts out 252 horsepower @ 6500 rpm and 273 lb.-ft. of torque from 1500-4000 rpm. So, really (and I may get struck my lightning for writing this), you don't lose much from the lack of a V6 (the last Accord's put out 278 horses @ 6200 rpm), especially considering the new car has also gone on a diet via the use of lighter weight materials. That new, 10 speed automatic transmission works really well, too, and in fact is one of the nicest I've driven recently. It feels like a dual clutch unit, with really quick shifts, and the manual mode (yep, there are paddles!) only enhances this. This, if you don't want a manual, is the transmission to get. A six speed manual is available as well, and if it's anything like the Honda six speeds I've driven in the past, it's a peach, but Honda Canada only offers it on the LX, Sport and Sport 2.0 models. The smaller engine gets saddled with a CVT, so be warned. There is the usual assortment of driving modes, from eco to Sport and, undoubtedly to no one's surprise, I found Sport easily the most interesting. It not only ups the throttle and transmission sportiness, it also tightens up the suspension and steering. And it works very well. The suspension is great anyway, but Sport makes it NICE! Good things abound inside the Accord, too. The centre stack's LCD interface has been redesigned for people who don't have enough hair to tear out in frustration, and it now sports real knobs for volume and tuning – and they're very classy looking and feeling knobs. This new system is a huge step forward in usability! In fact, Honda has addressed nearly all of my various whines about their interiors. As I noted in my review of the CVT-afflicted 1.5 litre Accord, "my only quibble now - and it's a common one with non-Hondas, too - is that (the LCD's) just a tad far away for my stubby little tentacles to reach with ease." The rest of the interior layout is good, too, with a nice and comfortable driving position and a good greenhouse. The rear seat seems a little tighter than the last Accord's, but it's fine for two and not excessively tight for three as long as they're not BFG's. Even the driver aids didn't annoy me as much as in other recent Hondas. When I put them to their least obtrusive modes I didn't have any more major issues - so either Honda has refined this or I've finally figured out how to configure them (I don't do owner's manuals unless absolutely necessary, at which time I whine about incoherent design). You still get the damn seatbelt warning, but I got around that by putting a falconry hood over my wife's head so she wouldn't know we were stopped until we were actually stopped. That reminds me. Any of you know a good divorce lawyer? I jest, of course. As with the last new Accord I drove, the two litre Touring was also the easiest "smart device pairing" Honda that I've experienced in years. It usually takes multiple attempts and plenty of cussing, but not with this new Accord. About time! I've been a Honda fan for many years and was the happy owner of a Civic back when the company was just making its eventually huge impact on the North American market. I don't know what happened in recent years, but it's surely a wonderful thing to see the company heading in the right direction with this new Accord. It isn't perfect, and I'm pretty sure it still wouldn't be on top of my shopping list in this niche, but it's a terrific car and Honda will undoubtedly – and deservedly – sell about a googolplex of them.